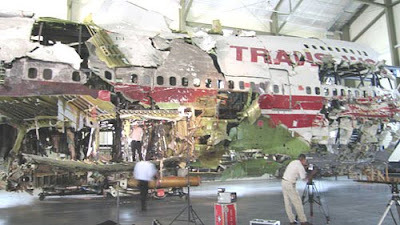 On July 17, 1996 a Boeing 747-100 crashed into the Atlantic Ocean, many theories suggest that it was a missile launched by the US Navy or terrorists who put an on-board bomb. However, nobody knew for sure what happened then. This incident was also a mystery unsolved up until now. Interlocutor: Here I have scheduled a question regarding to an aviation accident. I refer to the case of the flight TWA 800 occurred in 1996, which has arisen a lot of controversy. Many have the hypothesis that the destruction of the airplane was due to the impact by a missile at the moment it was flying over an area of military tests; others say that it was a bomb, while others say that a UFO crashed against this airplane. This issue is very important because, as they say, it is one of the biggest mysteries in the aviation of the United States. Ruanel: The airplane that you mention was impacted by a small ship. Interlocutor: How was that ship? Ruanel: It was a small ship what you would call a a two-seater ship, manned by two extraterrestrials, this ship was surrounded by an energy field and although it would seem unbelievable, this extraterrestrial ship survived unharmed the crash. Interlocutor: How could the collision take place? Were the extraterrestrials distracted? Ruanel: There was a flaw in the gravitational direction of the space ship, because extraterrestrials are also fallible beings, and that malcfuntion produced the accident. Interlocutor: Obviously it was not something they did on purpose. Interlocutor: I presume that the Mother ship was far from that place. Interlocutor: Where did the aliens come from? Ruanel: They came from a distant stellar system, Regulus 5. Interlocutor: What was the size of the mother ship? Interlocutor: 500 meters of high? Interlocutor: I cannot believe it! It is really something impressive. Ruanel: Yes, because we are speaking of several floors. Interlocutor: I am astonished. is this a normal size in mother ships? Ruanel: No, it is not normal, because they are ships where whole contingents travel. Interlocutor: How many extraterrestrials were traveling? Interlocutor: How about their mission? Maybe tourism? Ruanel: No, not tourism, because it was a study trip. Interlocutor: What is the distance from Regulus 5 to the Earth? 500 light years? Ruanel: Correct, approximately. But I want to clarify a very important thing before: there are different types of grays. These aliens from Regulus 5 are beings somewhat gray brownish, and they have their skin quite hard, almost as if it were the head of a chelonia. Interlocutor: Are we speaking of a turtle? Ruanel: Correct. they have their skin very rough and hard. Interlocutor: Are they humanoids or they belong to the animal Kingdom? Ruanel: They are humanoids but reptoids. Interlocutor: Humanoids reptoids? Is that so? Ruanel: Let us say that their skin, their metabolism is reptoid, but they copulate and they bear children like mammals, they don't lay eggs. But rather their DNA structure it’s like a reptile. Ruanel: Nevertheless, in the planet Earth there is an animal called platypus which is hairy, it has a duck beak, it lays eggs, and it is mammal. So there is an entire genetic set in the whole universe. Interlocutor: Concretely, one cannot say if they are humanoids or animals. Ruanel: They are mammal reptiloids. And I had urgency to clarify it because up until now this fact had not been given in what we call Unveiled Enigmas. Interlocutor: Is there something interesting we could say about this planet Regulus 5? Ruanel: It is a very advanced planet technologically, and although they are not passionless they are not interested in poetry or philosophy. They are only interested in research. Interlocutor: Technological research I guess. Interlocutor: Did they travel through time? Ruanel: No, because that doesn't matter to them. They are only interested in traveling through the whole Galaxy. Interlocutor: In conquest or study? Ruanel: Only to study. We can also stress that they have armed all their stellar system in order to avoid other extraterrestrial invasions and all of those things. Interlocutor: How many planets does their stellar system have? Ruanel: In Regulus there are 14 planets and all of them are fortified, the same thing happens with their satellites that operate as advanced posts. The planet of these beings is the fifth from its star. Ruanel: No, for the moment that’s all. This entry was posted at Tuesday, August 11, 2009 and is filed under Secrets . You can follow any responses to this entry through the .